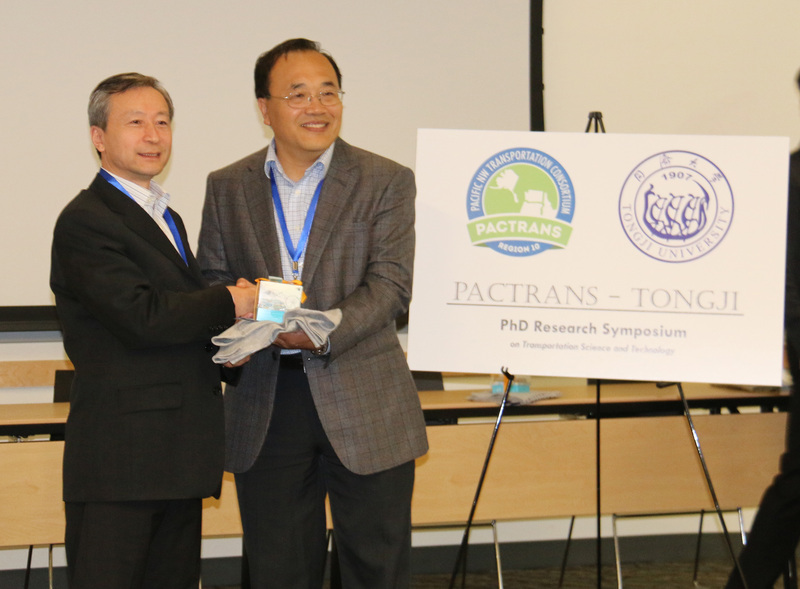 Last week Monday, August 1 through Tuesday, August 2, 2016, PacTrans hosted a symposium co-sponsored by both PacTrans and Tongji University on beautiful University of Washington campus. Three professor and eight PhD students from Tongji, as well as three PhD students from consortium partner university, Oregon State University, joined PacTrans director, Dr. Yinhai Wang, along with thirteen of his lab’s PhD students for a wonderfully successful event. The symposium focused on PhD research in transportation science and technology. Twenty-five PhD students had the opportunity to learn about their peers’ research in the areas of active traffic control, transportation data modeling, and autonomous/connected vehicle. UW’s Civil and Environmental Engineering Chair, Dr. Greg Miller, began the event by welcoming everyone to the University of Washington. This was followed by welcomes from Dr. Yinhai Wang and Tongji Professor, Dr. Bing Wu. After two brief keynote speeches by PacTrans associate director of education, Dr. Anne Vernez-Moudon, and Tongji professor, Dr. Lun Zhang, the professors turned it over to the student, who spent the next day and a half presenting their research and asking/commenting on eachothers’ work. A total of sixteen of the PhD participants were offered the opportunity to spend about twenty minutes presenting their work. Each presentation was followed by about ten minutes of question and answer. The professors were very proud of the students for the cutting edge research we are all conducting in the transportation field, and the students were very grateful to have had the opportunity to share their work and receive feedback. PacTrans would like to give a huge and genuine thanks to Tongji University for traveling so far and putting so much time and energy into making the event the success that it was. We are excited to continue building strong relationships with our counterparts abroad in the future.